30 January 1881: born in Ôsaka in the district of Kasaya-chô. November 1886: he starts his career as a child actor; his first stage name is Itô Unosuke. January 1902: Itô Unosuke takes the name of Ichikawa Unosuke I (his real name). January 1909: Ichikawa Udanji I and his son Ichikawa Unosuke I respectively take the names of Ichikawa Sai'nyû and Ichikawa Udanji II at the Kadoza. September 1914: premiere at the Hongôza of the drama "Waki Noboru Mizu-ni Koi Taki"; Udanji plays the role of Takimado Shiganosuke, in reality the spirit of a giant carp [casting]. June 1935: Udanji plays at the Naniwaza the roles of Ôboshi Yuranosuke, Yoichibê and Sadakurô in the drama "Kanadehon Chûshingura". 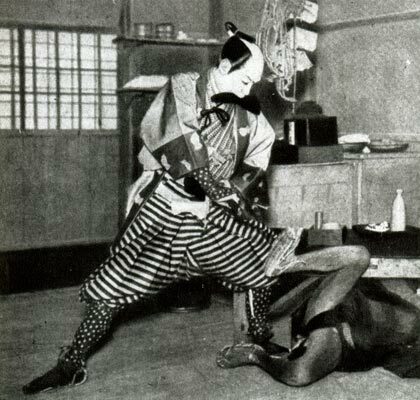 January 1936: Udanji plays at the Nakaza the roles of Sagisaka Bannai, Rokuzô and Jûtarô in the drama "Kanadehon Chûshingura". April 1936: Udanji appears on stage for the last time, playing at the Nakaza the role of Sakanaya Sôji in the drama "Higo no Komageta"; his main stage partners are Bandô Jusaburô III and Nakamura Kaisha. Fall 1936: Udanji falls ill.
16 October 1936: Udanji dies. Ichikawa Udanji II was a Kamigata actor, who followed in the footsteps of his father, excelling in hayagawari and keren, like the koi tsukami scene, the chûnori in a wicker basket for the robber Ishikawa Goemon, or the stage tricks of "Yotsuya Kaidan", "Hôkaibô" or "Kohata Koheiji". He was also a talented dancer, especially in spectacular dances like "Ayatsuri Sanbasô".